Really, in 2009 one could almost exclusively listen to nothing but reissues and be perfectly content. The depth, breadth and quality of the stuff coming out these days is just impressive. Enter the Feelies. Released this week, the new Bar None reissues of bands first two LPs, Crazy Rhythms and The Good Earth, are, for fans, a minor godsend. Keeping up with the times, with a nod to both the past and recent vinyl resurgence, the label has made the reissues available in three formats: vinyl (plus mp3 download card), digital and compact disc (with a code to download the bonus material). Unlike other recent vinyl reissue programs that do not include an mp3 download coupon, here everybody wins. While any reissue project obviously appeals to those who bought the albums during their original run they also stand to turn on a new batch of listeners who either missed them the first time around or were two young to notice upon their initial release. I personally fall into the second group. 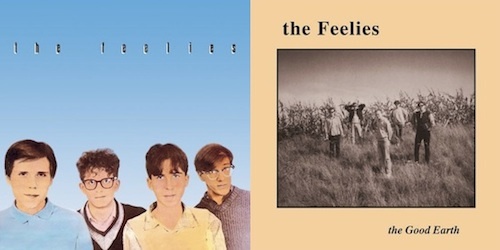 Like many, I discovered the Feelies by proxy, via R.E.M. — Peter Buck specifically. Buck himself co-produced the band’s 1986 sophomore LP The Good Earth. A lot of bands copped Velvet Underground moves in the ’80s, but few did it with the class and originality of the Feelies. Things changed a bit after these two releases (and hell, even between these two – six years is a long time between records) but listening now it’s apparent both the influences they pull from and the current artists who have since pulled from them. That’s the great thing about the give and the take in music – it’s cyclical. Oh, and if you find yourself in New York this weekend for All Tomorrow’s Parties make sure you catch their set…and leave a comment letting us know how it was. In honor of the 30th anniversary since its release, the band is performing Crazy Rhythms in its entirety. I believe I still have my original LP of “The Good Earth” from my record store days in Iowa City in the mid-80s. Bought “the Good Earth” on Vinyl in 1987. And again on CD in the the 90’s. Still stands up as one of my all time favorites. A friend and I have said this for years:There is probably not a better road-trip driving album than the Good Earth. The album is a perfect soundtrack for the open road. wow, this is brilliant. can’t wait to pick up the full albums! I’ll second the WOW of the previous post. Never ever heard of these guys before, not I must part with some cash. Saw them in Philly back in March and they sounded brilliant. Played a solid set with three encores, chuck full of covers. Can’t wait to see them later today! i’ll second the earlier comment that “good earth” is one of the best road-trip albums. i remember listening to it over and over while driving back and forth between atlanta and athens in the ’80s. The only experience I have with the band, really, was a live show at the 40 Watt in Athens — Summer 1991. Oddly, perhaps, my most vivid memory was that I thought they played the best cover of “Paint It Black” I’d ever heard. Anyway, I should give these a listen and thank you for the taste.